Confidence does not come easy. Fear does, disappointment does, anger does, failure does; each with little or no effort. But confidence, courage, composure, or conquest does not. If it did, more people would display it in their daily lives. Because it takes effort, because it takes risk, because it takes guts to dig down deep within the soul to mine the very best you have to offer, very few ever feel or act poised and able to assert themselves. Most people never get past the diversions and discomforts, trials and troubles of daily life and push through to success. They get tired of the battle, focus too much on their mistakes, and hand over their lives to the naysayers and critics. They are unfulfilled and unhappy but miserably content to live without passion or a sense of mission. Author Seth Godin in his dandy little book, The Dip, writes, “Extra ordinary benefits accrue to the tiny minority of people who push just a tiny bit longer than most.” I’m guessing you want to be one of those “who push just a tiny bit longer than most” and become a person of great confidence. You want your life to mean something and you want to live with passion. It does (your life means something) and you can (live with passion)! Right now as you read these words, you have what it takes to become confident, composed and secure within yourself. Right now you are able to forge ahead to self assuredness despite past mistakes, betrayal, unfair treatment, etc. Right now you have what I like to call “perseverance power.” It was imbedded in your soul by God himself even before you were born. 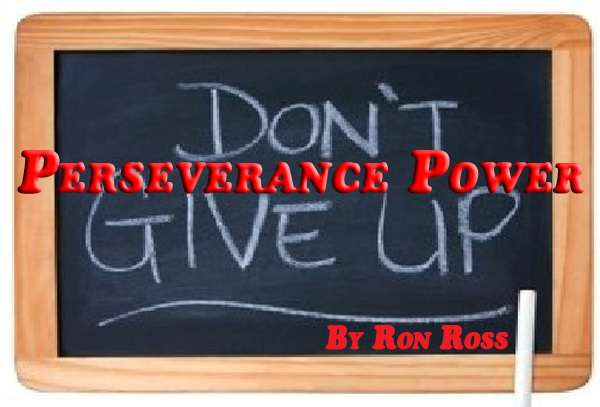 Over the next few iterations of this series you will see what “perseverance power” is, where it comes from, and how you can put it to work in your life so you can get past the anguish and discomfort of timidity, insecurity, and anxiety. Several points will be made including the following: Your Perseverance Power is divinely infused into your soul. You have already persevered in many areas of your life and you can build on that Perseverance Power and move to the next level. You will want to quit, that is normal, but you don’t have to. Perseverance builds character – so those who persevere come out better, stronger, happier, and more resilient than those who too quickly surrender. Stay with me each week for the next six weeks as we examine how you can bring success to your life and confidence to your soul using Perseverance Power.